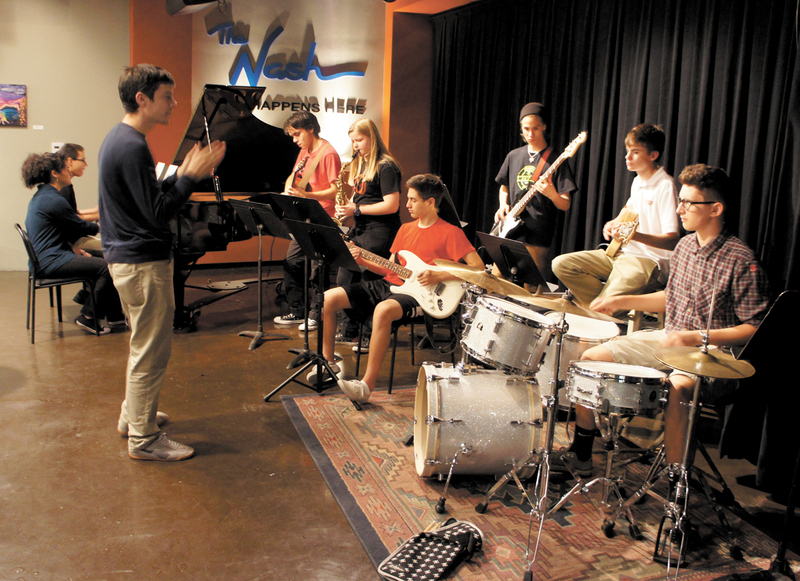 The Nash and Phoenix Conservatory of Music (PCM) have partnered to create a student Jazz Ensemble for the 2014-2015 year, giving students a chance to perform in the esteemed downtown jazz venue as well as learn from some of the people who play there. Will Goble keeps time as students from Phoenix Conservatory of Music’s Jazz Ensemble rehearse at The Nash in downtown Phoenix. Students include, from left: Angelina Avila and Kiernan Johnson on piano; Omar Torres on acoustic guitar; Elena Rogers on tenor sax; Jude Poorten on electric guitar; Elijah Krueger on bass; Joshua Jacobsen on electric guitar; and North Central resident Cian Callahan on drums (photo by Teri Carnicelli). The students, as young as 11, auditioned for the opportunity to learn and rehearse jazz in the newly established Jazz Ensemble, as well as play at The Nash in a true jazz environment. Fifteen-year-old North Central resident Cian Callahan, drummer of the ensemble, said playing live at The Nash was different than what he is normally used to. The year-long program is being led by instructors Will Goble, with the help of Ross Lewicki. Both perform on a regular basis at The Nash, located at 1st and Roosevelt streets. Goble works at both The Nash and PCM as an instructor, and is also the City Music coordinator at The Nash, helping to create the new student jazz ensemble program. On Oct. 26, the PCM Jazz Ensemble played three opening songs to start off The Nash’s Sunday night jam session. After the student jazz ensemble opened with their three songs, the stage was opened to jazz performers of all talents to play, and the ensemble members were able to stay and watch the performances. Cian has been studying the drums for eight years, and admits that he’d much rather be playing rock or hard rock instead of jazz. It doesn’t stop him from wanting to learn as much as he can, though. Enrolling in the Phoenix Conservatory of Music, which is located in Metrocenter Mall, was a “turning point in music” for Cian. “No pun intended, but it really has been instrumental in taking [Cian] to a new level in not just playing, but listening to music, appreciating music, understanding all the thought behind music,” Sean Callahan, Cian’s father, said. The Jazz Ensemble will perform a free concert at Metrocenter Mall at 3 p.m. on Sunday, Dec. 14. The Phoenix Conservatory of Music, a nonprofit organization that provides quality music education that is affordable and accessible, is affiliated with the Berklee City Music Network. For more information, visit www.PCMrocks.org. Editor’s note: Amy Pantea is a journalism student at the ASU Walter Cronkite School of Journalism and Mass Communication.